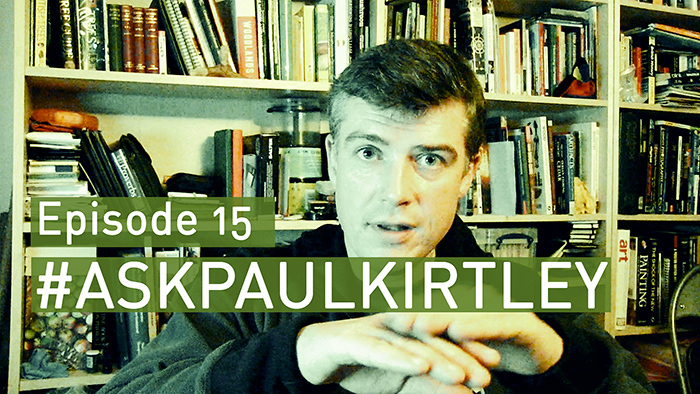 In this episode of #AskPaulKirtley I answer questions about bushcraft in South Africa vs Scotland, issues with bivvy bags, firebowls, squeaky bow-drills, mix and match NCFE courses, snakes and bugs under tarps and canoe vs kayak for journeys. #AskPaulKirtley is my Q&A video and podcast series that aims to answer your questions about bushcraft, survival skills and outdoor life. The idea here is partly to take the strain off my email inbox and get answers out to people in a more timely fashion. Rather than send an answer to just that one person, I’d like others to benefit from the answers too. So, just in the same way I’d previously write an email answer, here I’m going to speak the answer (which is much quicker than me typing out an answer, so I’ll get more questions answered as well as benefiting more people). Click here to find out the different ways you can ask me a question. Click on the four arrows bottom right for full screen view. Click on “HD” to stream the full HD version. Toggle HD off by clicking “HD” again. #AskPaulKirtley videos are also available to view on my YouTube channel. The videos will be uploaded to my YouTube channel and embedded in the Facebook Page associated with this blog as well as embedded here on my blog. Leave me a comment below. Let me know what you think of this episode. I read every one. But remember if you want to ask a question for a future episode, don’t do this in the comments below, do it in one of the ways explained HERE. thanx for answering the question on the squeaky bow dril. It’s good to know that it might be normal , and some times i might need to put up with it and work through. i will take the advice on the pushing harder if it starts to get polished and making sure the hearth board is stable and the dust collector are firm and not moving about. I hope this helps you get the results you deserve with all your bow-drill efforts. Squeaking is certainly normal. It doesn’t happen every time, but when we teach groups to bow-drill on our Elementary courses, it would be unusual for none of their sets to be squeaking when they are all practising at the same time. Keep on working on your skills and let me know how you get on. Also, if you have further questions, please feel free to ask. Noticed in this APK that you only described your tutor as “Mears” now you always use people’s full name or more often their first name, was this a faux par or is this a sign of some bad blood?? Good observation. While I’ve learned, and continue to learn, from many talented outdoors people, Ray Mears was a significant one for me. Not so much because I attended courses with him 15 years ago but also because I then assisted him on courses part time for a couple of years, then worked with him full time as Course Director of Woodlore for a number of years. The period of time I spent learning from him directly spanned ten years. But I don’t generally refer to him as “Ray”. My mum’s brother is called Ray so that’s who I tend to refer to as Ray first and foremost. Also, I work closely with Ray Goodwin, who I tend to refer to as “Gooders” when speaking with other people, but call Ray when working with him. Also, one of my team at Frontier Bushcraft is called Ray. So, in conversation, I do tend to refer to Ray Mears as just “Mears”. That said, I haven’t heard from Ray Mears for a number of years. Even though he wished me well when I finished my time working with him, he tends to cut off ties when people leave his employ. I’m not special in this regard – you only need ask any of the people who have worked with him over the years. So, how he feels about me now, I don’t know. But either way, I don’t take it personally. I’m very happy to have had the opportunity to work with him. Also, I would point out, like any other job that you or other people reading this may have in your life, my time working at Woodlore as Course Director was a job. Albeit a prominent role in a particular niche, it was nevertheless a job with a relatively small business in an outdoor training and adventure travel industry which is huge. Having run my own bushcraft school as well as writing for this blog and various print publications for the last five years, along with all courses, expeditions and personal trips during this time, Woodlore seems a very, very long time ago. There’s a hell of a lot of water under my bridge since then. I’ve come a long way further in my leadership, teaching and personal outdoor skill set since then. All of this building on a solid platform from the previous experience I’d gained, of course, but my development has accelerated compared to the previous five years. There are multiple reasons for this but one major reason is that there has been a clear benefit from the experience of working in the wider world with other leading professionals, both in the outdoor industry and in more diverse fields. So, there’s no bad blood from my perspective. It was a good opportunity at the time but I’m very glad to have graduated from that role and progressed onwards. Hi Paul, another great podcast with outstanding views. One thing I noticed on the kayak vs canoe questions was you seemed to skip over the sit on top style. Here in the USA they have been becoming more popular for fishing and touring inland lakes. I use one for camping and exploring estuaries and rivers along the coast here in North California. All though it is a wetter sport than canoeing. Thank you again for a great show and sharing your expertise with us. Hi Wil, good to read your comments. Thanks for posting them. Yes, it’s interesting to see the rise in popularity of the sit-on top style of boat, particularly those aimed at fishing. I’ve never used one myself but have seen them in stores such as Bass Pro Shops in Canada. I also met a guy on the French River, Ontario this summer who was taking a gentle trip around some of the islands near Wolseley Bay. But until you mentioned it in your comments I’ve not yet met anyone using them for multi-day trips. So, that’s pretty interesting to me. It would also be interesting to know if anyone else reading this has used them for multi-day trips. Thanks again for your comments. It’s always good to hear about what people are doing in their part of the world. I started out primarily using a sit on top kayak for fishing in harbors and near-shore rock piles. A friend asked me to accompany on a canoe trip down the Eel river here in Northern California and I accepted. My kit was similar to your canoe kit and everything is stored in Sealine waterproof bags. The inside storage areas do get damp from condensation and hatch seals that aren’t 100% perfect (hence the drags) but work similar to a trecking or sea kayak for storage, only smaller. My Wilderness Tarpon 120 has a payload capacity of around 350 pounds. The cargo or tank hold behind the seat is an open stowage area that holds my stove cook kit and other gear that can be wet. With the use of wetsuits I can comfortably paddle 45*F water and folks in dry suits commonly paddle in even colder water. Generally it is very similar to canoe camping just a bit wetter but with more maneuverability than a trecking canoe. I will admit that using single purpose clothing for multi day trips is a bit of a pain. They are definitely the best hammock I’ve used and worth the money. Thanks John, I’ll check out the hammocks you mention. Whereabouts in the world do you like to do your winter hammocking? Hi Paul,As much as I love hammock camping I find I need to have open vistas all round so a Tarp is my greatest love , but not always the best choice as wind/and flying beasties can be a factor on how enjoyable the camp is.Canoes all the way for me never enjoyed kayaking even in white water much prefered a large inner tube to sit in over a kayak,lol. So Mr kirtley you have discovered my evil plan eh. I honestly thought I had got away with it, 15 episodes in that’s a pretty good run before getting rumbled. Dam your powers of bushcraft deduction. Seriously though a very big thank you to Paul for all his hard work, and as requested I will spread the good word to the masses. Ernst Stavro blofeld. Woops I mean Adrian. Have to agree here Adrian. Great source of information as always. I have finally got round to booking one of your courses Paul, really looking for to it. Thanks Matt. Looking forward to seeing you next year. Interesting and entertaining as always. Keep up the great work! Another informative episode. Thank you. Your views on NCFE were interesting. I have an aspiration to instruct as I have a chance to change careers in about four or five years time. Allied with a lifelong passion for the outdoors I hope I will have a skill set which will make me a positive asset to any school. Any information shared by you on this is gratefully received. Your bookshelf was most interesting. Sadly the low resolution of my device screen only revealed limited information! I have found your expanding reading list on your blog/site very handy, but maybe just a brief film entitled ‘PK’s bookshelves’ , scanning the whole library might be a fun insight, and could just go viral! Thanks for your comments and I’m glad you found this episode interesting, particularly with respect to the NCFE question. Good luck with your progress towards changing careers. Let me know if you have further questions. Just about rucksack, personally use a 35 lt as summer day pack and the 45 lt for winter day pack. But if I stay out within three days in summer I normally use 45 lt and within three days in winter I go for 56 lt.
Paul, I’ve just listened to episode 17 on my drive home from work – went to comment on it and it’s not even been uploaded here yet – that’s how keen I am on your work! Another excellent podcast from you. Your dulcet tones and expert knowledge get me through many a traffic jam on my way home. Always balanced, always considered, your knowledge is up there with the very best (from a fellow ML) and your interviewees are relevant broad and well chosen. Was disappointed to hear from the idiots criticising your office episode! I love the variation and amazed at the quality you manage to deliver with your outdoor recorded episodes – I’m surprised there aren’t more inside! Good on ya for ignoring the haters and trolls – don’t give them another second and just hit delete/block! Keep up the good work Paul – another very satisfied listener. It’s so great you give up your time to do so many excellent podcasts for free. I thoroughly enjoy all of the social media stuff you do for free. It has helped me decide that the next bushcraft course I do will be at Frontier! Thank you! Hi Paul, a funny story involving squeaky bow drills. My brother and I recently did an overnight hike into Ridin Mountain National Park here in Manitoba. It was a gorgeous November day still in the plus temperatures which is rare for this part of the world. There was a skiff of snow on the ground and we were able to observe quite a few wildlife tracks including what we were pretty sure we’re wolf tracks as there is a pretty healthy wolf population in the park. This was confirmed the next morning as we woke up to a chorus of canis lupus the next morning. We decided that morning to try our hand at the bow drill that morning for ouR breakfast fire. The first few attempts produced such a squaKing an squealing all the while with the wolves in the distance. Then it struck me that the sound of my bow drill sounded just like calls that guys use for calling in coyotes and other predators. Unfortunately Though we kept at it for some time we weren’t able to call any wolves close enough to see but we did seem to attract the attention of several Ravens and a very friendly whisky Jack. Thanks for the podcast. Haha great story. I’ve never used bow-drill for calling wildlife but I may just have to give it a go! Plus temperatures in Manitoba in November – that’s warm.